Now turn the unit upside down such that the unit is resting on the potentiometer knobs. 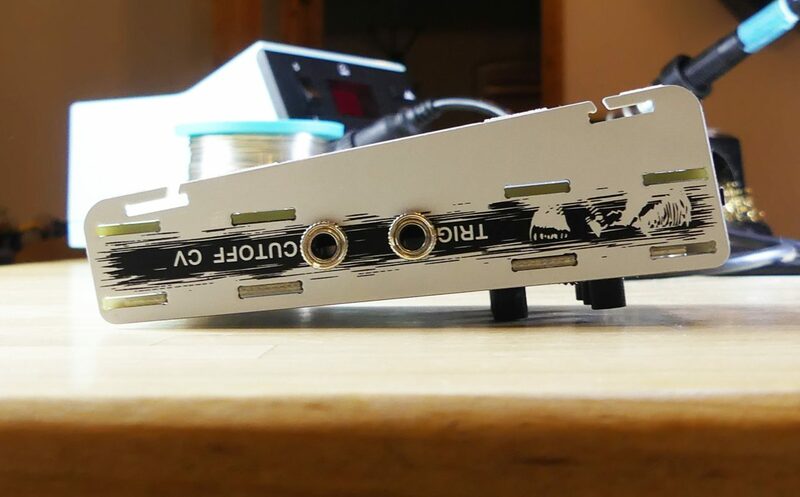 The switches should fall forward and press nicely against the front panel. To make sure gently tap the unit while upside down and poke the legs of the switches. 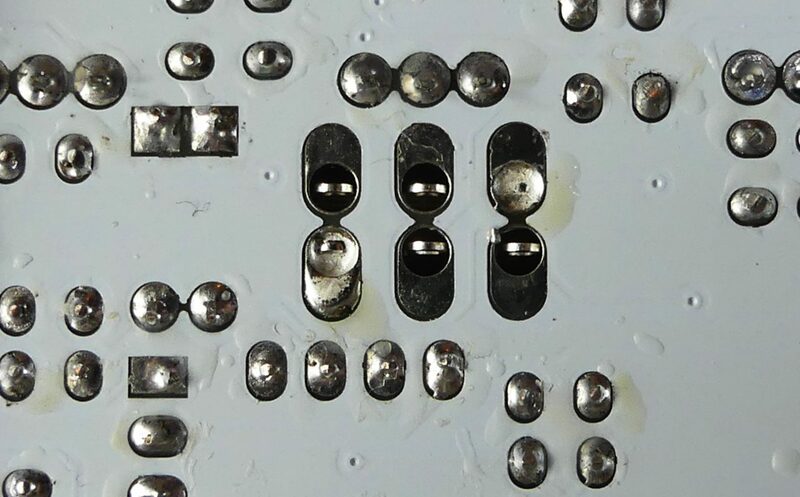 Apply a small amount of solder to two of the switch legs. Turn the unit over, if the switch appears to be wonky or rubbing against one side you can heat up one of the joints and apply light pressure to correct the alignment. Repeat for each switch until happy and then solder all the legs. 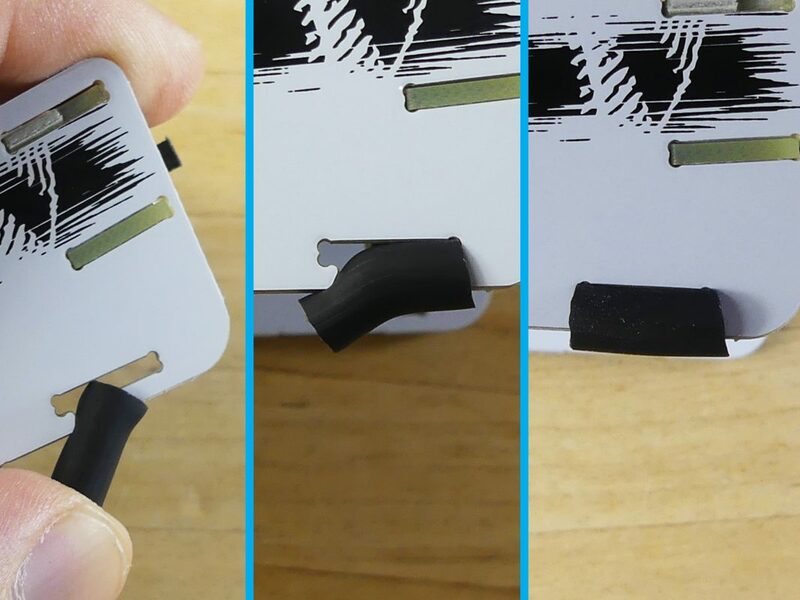 Install the feet by pressing the rubber tube onto the long section of the cut-outs on the bottom edge of each side panel. Then snap over the short nub to finish. After powering it up turn the sensitivity and decay controls to max, ensure the source is set to int (internal). Connect the output to an amplifier/powered speaker. Adjust the VOLUME trimmer to taste, clockwise for less, anti-clockwise for more. CUTOFF CV ADJUSTMENT: Using your preferred method of tuning, adjust the CV LEVEL trimmer until your preferred tuning is achieved. V/OCT is achievable and tracks nicely for a percussion synth. Alternatively use your favourite sequencer to feed the Metal synth with a variety of inputs and tune to taste. Power In – The power socket accepts centre positive, 5.5mm outside 2.1mm to 2.5mm centre and voltages between 9 to 12V DC. Power Switch – Switches the unit on and off. The power indicator LED is just below the switch. SOURCE Switch – Selects between the internal sound sources and the 3.5mm AUX IN socket. FIlter Mode – Select between low pass and band pass modes. SENS (Sensitivity) – Sets the sensitivity of the trigger/piezo input. DECAY1 – Sets the decay time of the initial (louder) hit. DECAY2 – Sets the decay time of the tail. SWEEP– Controls the amount of sweep applied to the VCF. SWEEP DIRECTION – Selects the direction of the sweep. RES (Resonance) – Sets the level of filter resonance, turn to max for self oscillation. TRIGGER [Input] – Apply external rising edge between 300mV to 9V to trigger. Experiment with the sensitivity knob to find the right trigger level. CUTOFF CV [Input] – Apply between 0V to 9V to control the VCF cutoff. Use the cutoff knob to find the sweet spot for your external equipment. OUTPUT – A line level output designed to be fed into a powered amplifier/speaker. Should not be used to drive headphones or low impedance equipment. Thank you so much for supporting our small business, please feel free to share your creations with us via the contact form, or more directly on instagram and twitter @rakit_kits or @rakit.kits on facebook.